Exceptional value - works well and looks great The only slight criticism we have is that the door's mirrored finish can make it a touch difficult to see the food cooking - asides from that it's great. Straight out of the box, the KOC9Q4T looks smart and surprisingly compact given the overall 28 litre capacity, measuring just 40cm in depth - so ideal for those with narrow worktops in their kitchen. Overall weight is around 16.6kg - so lighter than many similarly priced models. The box itself was slightly damaged, but this was in all probability down to the courier rather than the manufacturer - and the microwave itself was undamaged. In terms of design it looks good - more expensive than it's price tag anyway - the side panels feel a touch thin, but the door and handles have a reassuring solid feel to them. Overall build quality is pretty good, and it feels like it's built to last wear and tear. The instructions supplied are easy to follow - it took a minute or so to setup the clock - and the controls were intuitive and easy to use. Whilst in use, the Daewoo KOC9Q4T is pretty quiet - one slight criticism is that there is no higher rack supplied, so you cannot currently stack two plates - although you can always purchase one of these separately. It heats up food fast, and we have no complaints here. All in all you have 10 different power levels. The 1250 watts grill facility also performs well, and cooked food nicely. In terms of convection oven, this appliance packs 2700 watts, and provides a cheap and easy method of baking. We only had the opportunity to test this facility quickly, but it baked a test cake to perfection - our three testers were impressed. Cleaning the silver microwave was easy - simply a quick wipe and done. 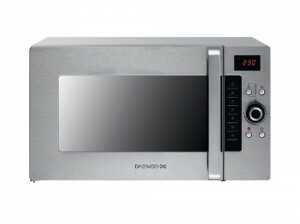 So what did we make of the Daewoo KOC9Q4T combi microwave overall? Amazing value combi microwave oven from Daewoo - if you have a budget of around £100, we're pretty sure you won't find a better microwave. Yes – it has a honeycomb textured stainless steel interior.